A Northern Territory course is showing Aboriginal people how to build successful enterprises based on local natural resources. The intensive natural resource and livelihoods course, developed by Charles Darwin University’s School for Environmental Research and the Desert Knowledge Cooperative Research Centre (DKCRC), teaches participants what it takes to run a successful business in remote Australia. Course leader Professor Tony Cunningham said the demise of Community Development Employment Projects in Aboriginal settlements meant the course had particular relevance to Aboriginal communities. 'They give people access to the cash economy,' he said. The intensive five-day course introduces participants to successful natural resource-based businesses and includes a mixture of theory and practise. Case examples of successful and unsuccessful Australian bush enterprises help participants to understand the formula for business viability in their communities. 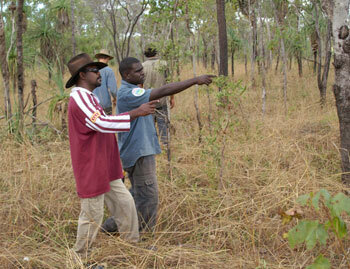 A successful enterprise run by the Bawinanga Aboriginal Corporation at Maningrida was the base for most of the course studies. The corporation was set up to provide employment for Aboriginal people outside the township of Maningrida and supports 800 people living in 35 remote outstations. 'They are a very entrepreneurial community and an ideal inspiration for our participants,' Professor Cunningham said. The DKCRC sponsored four Indigenous identities from Alice Springs to attend the course and included Rayleen Brown, the owner of local bush foods catering business Kungkas Can Cook. Young Djelk, a member of the DKCRC’s Bush Harvest Reference Group, showed Rayleen methods of sustainable harvesting of bush products. This included selecting longneck turtle and crocodile eggs, incubating them at the ranger station and selling the hatchlings to pet shops and crocodile farms. Josie Douglas, from the Desert Knowledge CRC’s Bush Products project and Charles Darwin University, was supportive of the course. 'It was one of the best professional development activities I’ve ever done because of the mixture of location, hands-on approach and mixture of participants and lecturers,' she said. The course will be offered again in 2008. For more information go to www.cdu.edu.au/ser/ShortCourses.html or contact gillian.ainsworth@cdu.edu.au.